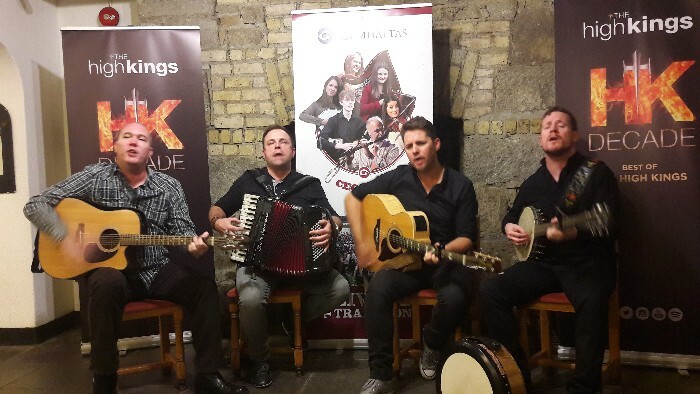 The High Kings celebrated their new album, Decade: Best of The High Kings in the home of Irish Culture, Comhaltas Ceoltoirí Éireann on Thursday 9th November. 16,000 fans worldwide tuned in to listen and interact with The High Kings; Darren Holden, Finbarr Clancy, Brian Dunphy and George Murphy. The group played an acoustic set including fan favourite, 'The Town I Loved So Well' and answered a fan questions before finishing with 'The Parting Glass'.